Autism awareness clothing is a great way to show your support of everyone with Autism. 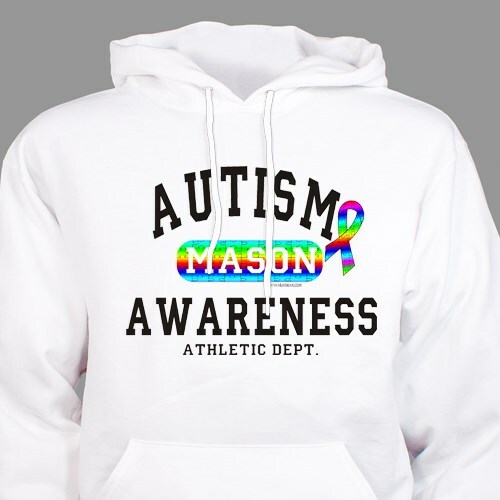 This Autism Awareness athletic apparel has been moved from our top-selling t-shirt to a cozy hoodie. Your walk and fundraising team will look great as they show their support for loved ones with autism. This Autism awareness design is printed on our 50/50 cotton/poly blend hooded sweatshirts, machine washable in youth sizes S-L and adult sizes S-2XL. Free personalization of any name is included. Additional Info For your next autism awareness event, find your awareness apparel right here at MyWalkGear.com. This hoodie is one that you can wear year-round to spread the word about autism awareness to those who may not be familiar with it. Our Autism Awareness Hooded Sweatshirt is another fantastic design.